The Aimpoint PRO is beautifully designed. Note the transparent rear lens cap. As if these contributions were not enough, Sweden also produced Aimpoint. As we discovered with our review of the Aimpoint Micro H1 red dot sight, the new Aimpoint PRO over-delivers. But is it the best red dot sight? In 2012, the Aimpoint PRO was made available to the civilian market. Got it? 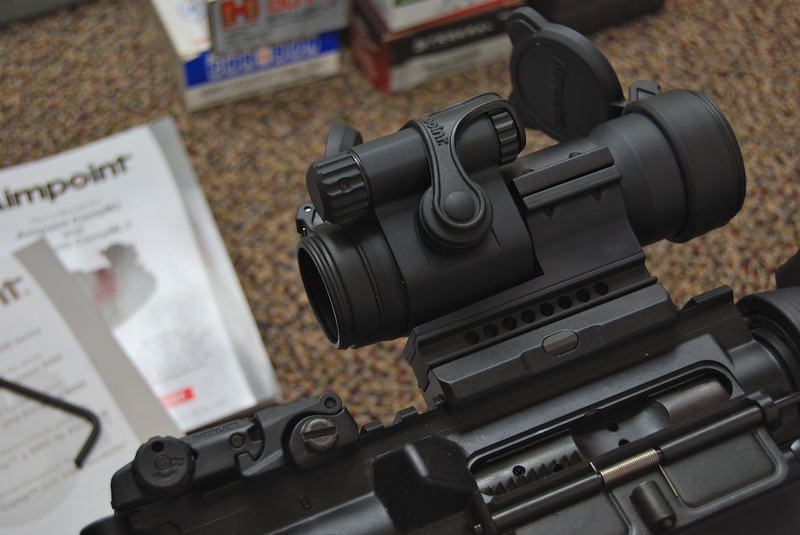 High points – Is the Aimpoint PRO the best red dot sight? Like the Aimpoint Micro H1 red dot, the Aimpoint PRO red dot sight runs 75% of forever. The single 3 volt lithium 2L76 battery runs for 30,000 continuous hours. That’s longer than the movie The English Patient. Although The English Patient seems longer once you’re trapped in the theater and doomed to hours of $14 cokes. In case you haven’t seen The English Patient, 3,000 hours equates to about 3 years of continuous use. We’re pretty comfortable with a design that runs for 3 years without switches or maintenance. Even if you’re really paranoid, just replace that single battery every New Years Eve before the festivities start and you become forgetful. Of course there is a real benefit to this longevity other than an exceptionally low battery replacement budget. Just leave this red dot sight powered on. Always. Then it’s ready to go without switches or any other manipulation. As we’ll see later, you don’t even have to open the lens covers. The Aimpoint PRO red dot sight features a 2 MOA (minute of angle) red dot. Intensity is adjusted by a knob at the 2 o’clock position from the rear lens. The knob is designed with deep grooves for easy grasp, even with gloves, and allows 10 levels of dot intensity adjustment. We found that you can adjust it easily with your weak hand without obstructing the lens. The mount has also been updated from the Comp M3 offering for effective use on AR / M4 type platforms. The QRP2 system accomplishes two objectives. First, it places the optic at such a height where the iron sights on an AR platform line up in the bottom third of the optic window. This allows easy use of the red dot without iron sights getting in the way – even if your rifle has a fixed front sight. Second, the mount features a large snap knob for mounting the optic on the rail. Simply place the optic on the rail and tighten the knurled knob until it clicks 3 times. This applies exactly the right amount of torque so your rail will not be damaged. And you can easily mount and unmount the optic without tools. Please sir, step away from the vise grips!It’s a really handy mount that proved to be solid over time and use. 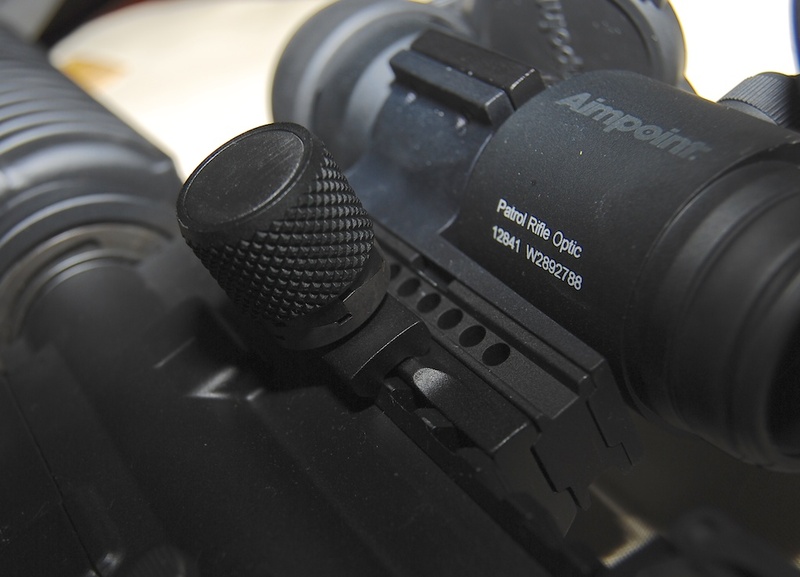 The height spacer of the QRP2 mount is removable if you want to mount the Aimpoint PRO on shotguns or sub-machine guns. Both front and rear lenses are inset into the optic body for extra protection. The front tube is threaded inside in case you want to mount an optional anti-reflective device. By the way, the Aimpoint PRO red dot sight is compatible with all current generations of night vision devices. It also can be used with Aimpoint’s 3x magnifier if you need to reach out and touch someone at greater distance. Like other Aimpoint products, the Aimpoint PRO is built with attention to detail. For example, windage and elevation caps, and the battery compartment cap, are all connected with a rubber strap so won’t lose any pieces. Aimpoint even includes a sticker to record battery changes and service dates. This round sticker fits on the inside of the front lens cap so you won’t lose track of it. And you’ll see it every time you open the lens cap. One of the first things we noticed about the Aimpoint PRO is the design of the included (and pre-installed) flip up lens covers. The front lens is made from black rubber and has two tabs that allow for easy opening. The front lens cover is spring loaded, so a light tap on either tab opens the cover all the way, and spring tension keeps it well out of the way once opened. The rear lens cover is particularly interesting. The cover itself is clear, so you don’t necessarily have to open it for use. As the Aimpoint PRO is designed for ‘both eyes open’ shooting, you can literally pick up the rifle and aim it accurately with both lens covers closed. The rear cover is clear, so you will see the red dot. Your offside eye will see the target. Your brain will put the two together and you’ll see a red dot on target. Of course, the sight picture is not as clear as with the lens covers open, but we found this scenario to be perfectly usable. This seemingly minor feature could make all the difference in a scenario where one has to react immediately. Obviously it could make a big difference in combat or defensive applications. Or it can help you avoid embarrassment in that upcoming 3 gun match. We hear much internet wisdom about how quality optics are expensive. And how you can get the “same exact thing” from some other company. Some folks insist that the actual optic is made in the same factory as a knock off and different brand names are applied as the units are shipped out the door. The mount co-witnesses perfectly with iron sights. Not so with the Aimpoint product line. They are made in Sweden by Aimpoint, for Aimpoint. Period. And the attention to quality engineering is apparent. The Aimpoint PRO is constructed from a solid anodized aluminum housing. Watertight screw caps for the battery housing and windage and elevation adjustments ensure that you can completely submerge this unit up to a depth of 150 feet. If you’re engaged in activities that cover your optic with sand and salt spray, no problem, just dunk it in clean water and you’re good to go. Do make sure the caps are on though. Of course the real test was at the range. We mounted the evaluation unit on a DPMS Panther A3 Lite 16 AR15 rifle. This model features a front sight post and rail on the back. We have it equipped with a Magpul flip-up rear sight. Even with the rear sight flipped up, the Aimpoint PRO’s red dot was easy to see. The front and rear sights lined up just about 1/3 of the way up the glass. Perfectly positioned in our opinion. As the Aimpoint PRO is parallax free there was no sensitivity at all to position of your head and eyes. As long as you can see through the tube, you’ll see the dot on target. We found this sight very fast to acquire. Just for kicks, we did try shooting some 25, 50 and 100 yard targets with the both lens covers closed. Remember, the Aimpoint PRO has a semi-transparent rear lens cap, so you can see the red dot without flipping the rear cap out of the way. With the front cap closed, your brain relies on your other eye to acquire the target. The eye looking through the optic will see the dot and your brain does a reasonable job of putting the two together. We found 25 and 50 yard targets easy to hit with the front cap closed. The 100 yard targets were a little harder to acquire accurately in this manner. The bottom line is that this feature works as intended. If you need to fire a quick shot, you can do it accurately without even opening the lens caps. All in all, this is another excellent optic and mount from Aimpoint. We’re going to have to buy one. Four Nuns! Built like a tank. Clear and easy to acquire. Those little details that Aimpoint considers make all the difference. We highly recommend this one. I’m wondering how this sight would do in low light compared to tritium iron sights like the XS Big Dot. I’ve tried an XS Big Dot on a Mossy 590. It’s my primary HD gun and I don’t use a light on it – I have ‘home court advantage’ & don’t want to give away my position. We leave a small fluorescent light on 24/7 but it doesn’t put enough light around the back door for the Big Dot to work well there. Plus my eyesight ain’t what it used to be.